I was born in South Haven, Michigan, grew up in Evanston, Illinois, and now live in Chicago with frequent visits to London. I am married to the artist and writer Eddie Campbell. I began making prints in 1978 under the tutelage of William Wimmer. I trained as a visual artist at the School of the Art Institute of Chicago, and received my MFA from Northwestern University’s Department of Art Theory and Practice in 1991. I have exhibited my artist’s books, prints, paintings, drawings and comics at Printworks Gallery in Chicago since 1987. In 2013, a major mid-career retrospective of my prints, paintings and artist’s bookworks opened at the National Museum of Women in the Arts in Washington, DC. My first books were printed and bound by hand in editions of ten. Two of these have since been commercially published by Harry N. Abrams: The Adventuress and The Three Incestuous Sisters. In 1997 I had an idea for a book about a time traveler and his wife. I originally imagined making it as a graphic novel, but eventually realized that it is very difficult to represent sudden time shifts with still images. I began to work on the project as a novel, and published The Time Traveler’s Wife in 2003 with the independent publisher MacAdam/Cage. It was an international best seller, and has been made into a movie. In 1994 a group of book artists, papermakers and designers came together to found a new book arts center, the Columbia College Chicago Center for Book and Paper Arts. I was part of this group and taught book arts for many years as an Associate Professor in Columbia College’s MFA program in Interdisciplinary Book and Paper Arts. Until May, 2015 I was a Professor on the faculty of the Columbia College Creative Writing Department. I’ve also taught for the Newberry Library, Penland School of Craft, Haystack, the University of Illinois at Chicago and other institutions of higher learning. I am currently on hiatus from teaching in order to get my own work done. My second novel, Her Fearful Symmetry, was published in 2009 by Scribner (USA), Jonathan Cape (UK) and many other fine publishers around the world. In 2008 I made a serialized graphic novel for the London Guardian, The Night Bookmobile, which was published in book form in September, 2010. In 2013, the illustrated novella, Raven Girl, was published in conjunction with the Royal Opera House Ballet production of Raven Girl, which was choreographed by Wayne McGregor. 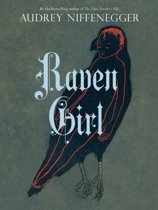 Raven Girl returned to the main stage at Covent Garden in October 2015. Currently, I am working on a sequel to The Time Traveler’s Wife. The working title is The Other Husband. I am also continuing to work on The Chinchilla Girl in Exile. Eddie Campbell and I are at work on a collection of comics adaptations of some of my short stories. Audrey Niffenegger heeft een Facebook account! Klik hier om naar Facebook te gaan. Audrey Niffenegger heeft een resultaten op Youtube! Klik hier om naar Youtube te gaan. 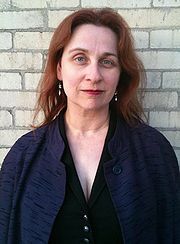 Audrey Niffenegger heeft een Wikipedia pagina! Klik hier om naar Wikipedia te gaan. Audrey Niffenegger heeft een IMDB profiel! Klik hier om naar IMDB te gaan. Audrey Niffenegger heeft een eigen website! Klik hier om naar de website te gaan. Hieronder vindt u een lijst met alle gevonden boeken van de auteur Audrey Niffenegger. De meest gevonden boeken zijn De Tweeling Van Highgate, De Vrouw Van De Tijdreiziger, Vrouw Van De Tijdreiziger, Ghostly en Her Fearful Symmetry.